168 pages | 54 B/W Illus. 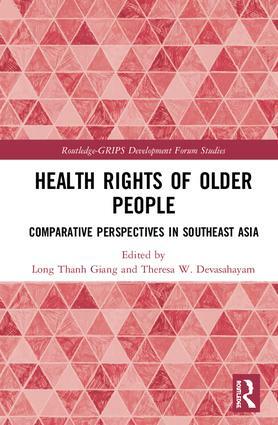 The book examines the health rights of older persons who are more likely potentially to face various disadvantages in terms of healthcare access and affordability, thereby impacting on health outcomes. The point of departure in the analyses is that the health security of older persons is guaranteed only if a country approaches the health of its citizens out of moral obligation, viewing health and well-being as a right rather than an entitlement. Data from five countries in the ASEAN region are analysed with the intent of highlighting the health inequalities and barriers at the societal and individual levels, on the one hand, as well as the gaps at the health and healthcare policy and programmatic levels within each country, on the other. It is also intended that the analyses of the data from the selected countries which represent different stages of development, and thus income levels, provide a useful comparative framework for policymakers in the ASEAN region. Long Thanh Giang is Associate Professor of National Economics University, Hanoi, Senior Researcher at Institute of Social and Medical Studies (ISMS), Hanoi, and Affiliate Research Fellow of the Oxford Institute of Population Ageing, University of Oxford. His research interests include the economics of ageing and health protection for older people. He got a PhD from National Graduate Institute for Policy Studies (GRIPS) in Tokyo. Theresa W. Devasahayam is Associate Lecturer at Singapore University of Social Sciences (SUSS). She has provided technical expertise to various projects for United Nations’ agencies and the Asian Development Bank. She has a PhD in Anthropology with a concentration in feminist studies from Syracuse University, New York, U.S.A. In recent years, global development thinking has shifted significantly from free markets to a more active role of government in supporting private sector-led growth. Developing country governments are enhancing policy capability to ignite and sustain growth and industralization. This book series sheds some light on what concrete procedure and method to adopt for the building of policy capability. The series builds on and complements the policy consensus by presenting mindsets, policies and institutions which generated high growth in successful latecomer countries. Concrete cases and experiences are provided. They are illustrated by comparative analysis and extraction of factors contributing to successes and failures in these cases. The series adds new perspective to global development thinking with East-Asian and Meso-level focus. Its pragmatic, concrete and comparative approach would prove to be useful in assisting policy making.